I blogged recently about having a fantastic story idea whilst in the middle of a project. Well, guess what? That fantastic story idea has now become my primary project, and Cupidity and The 25 Demons You Meet In Hell have been relegated to the backburner. This wasn't an easy decision. For one thing, is sure as hell doesn't look professional. What if 25/Hell had been under contract? I'd have a hard time justifying that to an editor, or my agent. Thing is, sometimes it is a decision you have to make for your own creative good. I wasn't happy with 25/Hell. Can't say exactly what it was; I had a funny main character, and a vision of Hell that I thought was pretty unique. Plus, a killer title. So what went wrong? I really can't say. I'd managed to get through 12 chapters, after all. Couldn't I have held on a bit longer? But there's the rub - I was hanging on to that project simply to hang on to it. Inside I was wishing I were doing something better. Then I came upon an idea with some real meaning for me, and I longed to jump straight into it. I held that new idea at bay for two weeks, hoping that 25/Hell would reinspire me. It didn't. So now I've launched my next book, tentatively titled Kids Who Know, and I've already written the first chapter. It feels right, and the writing isn't just a struggle. At least, so far. Time will tell how well this new project will work out for me. As for 25/Hell (and, for that matter, Cupidity and a few other half-finished projects on my hard-drive), I will hold onto it for the time being. Maybe I'll get to the point where I'll really want to tell that story again. Or maybe not. We'll see. In the meantime, please wish me luck with Kids Who Know. May it turn out to be everything I want - and need - it to be. Some of you have asked to see a picture of the new addition to our family. 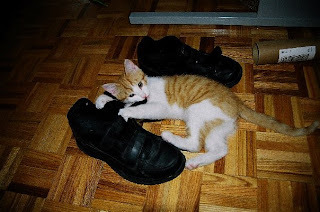 Here is Karma, our adorable kitten, savaging my shoes. Isn't he cute? It feels like forever since I've been here - my life suddenly got very busy and I've had very little time to sit down at a computer and blog. First and foremost, I want to discuss Polaris, formerly known as Toronto Trek. This is another annual sci-fi convention for Toronto, and it happened July 6-8. I rented a table, spoke on six panels, and sold lots and lots of books. I created a bunch of fake religious tracts to promote Epoch and Section K, and they got a good laugh (though more than a few people thought they were real tracts and walked away quickly). I met and talked on panels with writers I respect and admire, including the wonderful Tanya Huff, who gave me a quote for Section K. All in all, a great weekend. I owe lots of praise and thanks to my supportive wife, Violet, who came with me and managed the table while I was off doing my stuff. On the Saturday evening I had three panels in a row, meaning I had to leave her on her own for three hours. She managed, and even made some sales while I was gone. It's great to have the perfect woman for you at an event like that. Not that I could keep her away - she loved the convention, and spent a lot more money than I did on sci fi stuff. She bought a remote-control K-9, the robot dog from Doctor Who. He rolls around our apartment making laser noises, saying "Affirmative, Master!" and frightening Karma, our kitten. I tried to limit my spending, but I did shell out for Cyber-Stompin' Bumblebee for Violet. Bumblebee is one of the Transformers, and my wife thinks he's really cute. She has a collection of Bumblebee action figures, and has every single version ever produced since 1984. When the Transformers movie came out, all of a sudden there were many more Bumblebees to buy. Cyber-Stompin' was one of them, and so Violet had to have it for her collection. She now has 18, but I think there are a few more out there somewhere. Now that Polaris has been, come and gone, I'm back to a more or less regular life. I have a temp assignment that is going well, spelling an end to my four-month banishment from the workplace. I'm still writing The 25 Demons You Meet In Hell, but I've put Cupidity on hold for the time being. Plus, I've seen Transformers movie twice now, with more screenings soon to come! I'm a lot busier, but I'm having a great summer.